Oh come on. I mean, I’m looking at this article right now and although I know that there are more important things in the world to be angered over than some teenager being denied the right to have her tattoo immortalised in a year book photo, I can’t understand why anyone would go to the trouble and effort of erasing a tattoo from someone’s photo. Apparently, that’s exactly what the higher ups at Wasatch High School in Heber City, Utah decided was an appropriate course of action. Granted, Wasatch High School is a Mormon school and they do have what are called “modesty” standards in place for their students, but are tattoos still really that big of a deal in 2014? The tattoo in question that so deeply offended the staff of Wasatch High belonged to Shelby Baum. The sophomore’s collar bone was tattooed with the words “I am enough the way I am”. 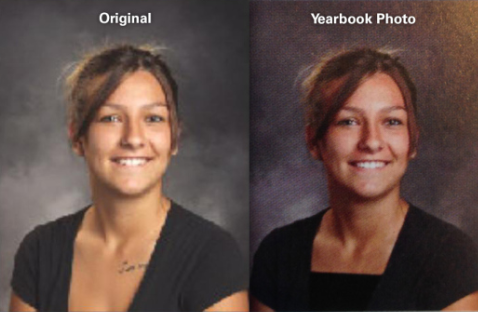 Baum was allowed to pose for her year book photo with the tattoo clearly exposed, but when the yearbooks were distributed, she discovered she had been edited. ‘The tattoo is a simple line of script Baum chose — after consulting the school dress code — to remind her of her journey out of difficult times during her childhood. It seems to me that for young women especially, their teenage years are an extremely difficult time. So many young women suffer from a lack of general confidence that often carries on into their adult lives. A young girl who is emboldened by a tattoo is not a bad thing and should not be treated as such. Her being proud of who she is does not deserve punishment, it deserves praise. This entire incident only serves to underscores how the personal value of a tattoo is all too often belittled by those in positions of power and authority. I don’t expect a lot of open-mindedness at any sort of religious institution, but it seems especially hypocritical to me that a religion such as Mormonism would condemn one of its followers for immodesty, given that the religion’s founder was after all, a convicted felon. Furthermore, Baum’s alleged immodesty was not in fact, prohibited by the school’s dress code. I sincerely hope that Shelby Baum doesn’t take her high school’s intolerance to heart. She’s in the right. All of you out there who have tattoos and are proud of them are in the right (unless of course your tattoo is of something truly inhumane and horrible.) Power to everyone who gets strength from their tattoo. You don’t ever have to justify it to anyone.